What you don't see is the pool below them. 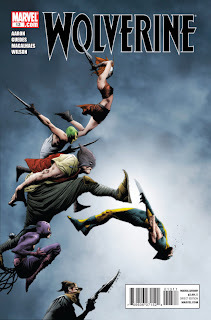 If you follow my link for Room With a Review: Wolverine #13, you will get my thoughts on Jason Aaron's dragging Wolverine storyline. Plus (there's always a plus), I gush over Jae Lee's cover art, and I recall a scene from Austin Powers which Jason Aaron could learn from.